The Atlas-F ICBM (operational 1961-65) was an important component of national defense during the Cold War. 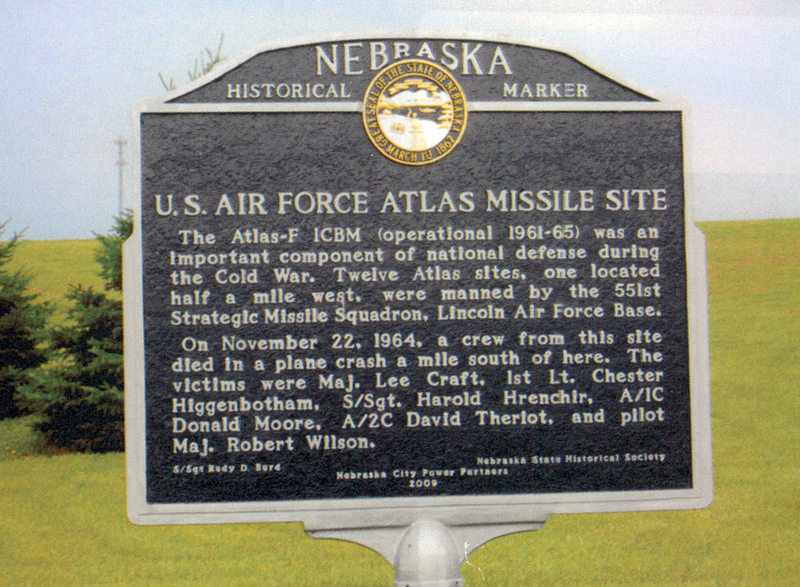 Twelve Atlas sites, one located half a mile west, were manned by the 551st Strategic Missile Squadron, Lincoln Air Force Base. On November 22, 1964, a crew from this site died in a plane crash a mile south of here. The victims were Maj. Lee Craft, 1st Lt. Chester Higgenbotham, S/Sgt. Harold Hrenchir, A/1C Donald Moore, A/2C David Theriot, and pilot Maj. Robert Wilson. “U.S. Air Force Atlas Missile Site,” Explore Nebraska History, accessed April 19, 2019, https://mynehistory.com/items/show/391.